Edison Pen Co – Pneumatic Filler! I’m proud to announce that the Edison Pen Co is releasing a Beaumont Pneumatic Filler to the Signature Line. This is a pretty unique filling system. They were very popular in the 20’s and 30’s, as well as the 50’s and 60’s. As long as my pen history is correct, no pen company has made pneumatic fillers on a production scale since then. Please watch the animation and video below for all details. 04:10 – What is a Pneumatic Filler? How Does it Work? 07:07 – Why a Pneumatic Filler? What are the Advantages? Please visit the Beaumont Pneumatic Filler Main Page for all specifications and pricing. We have almost 40 of these pens currently inventoried and ready to ship. Please visit the following link to see all Beaumont Pneumatic Fillers that are currently inventoried and ready to ship. Or, of course, you can place a custom order in whatever material you would like. WIN! So much win, and all of the epic variety! I also love demonstrators. But unfortunately, the brass tube has to be brass or another metal. Nothing translucent. So the demonstrator that you see in the video is about as good it can get. Also – I use a light dusting of talc on the sac to keep it dry and moving smoothly. This talc kind of mucks up the view! That’s primarily why the demonstrator in the video looks a little rough. So I can made demonstrators out of this pen, but they simply won’t be totally clear, and they have to have the brass tube hiding the sac. Just the nature of the design. 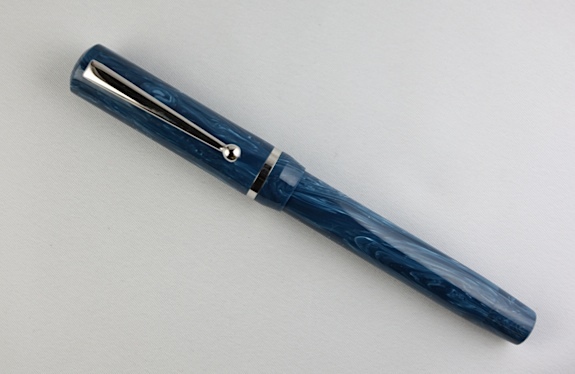 Seriously though, the pen is fantastic and the demonstrator will be even cooler. There are all kinds of filing mechanisms out there, but the pneumatic is hardly used and perhaps almost forgotten. The "coolest" brands make lever fillers, that I also love, perhaps to get the vintage-loving slice of the market, but ignore pneumatic fillers for some reason, while they’re equally, or even more practical and cool. That’s why I think that you’ve got a genius idea producing this pen. Great job! Thanks Markos! I appreciate the comments! Kudos and Well done to all at Edison – beautiful looking pen and great filling mechanism – funds will be found to purchase one!!!! Congrats on the new design. This is a great idea. Glad to see the innovation by a real pillar of the pen community. One question: Since the section is sealed what would one go about replacing a sac that goes bad or for some other reason becomes defective? Does Edison service the pen or are there other alternatives? As long as Edison exists (and we’re not going anywhere), we’ll service the pens, no problem. But even if there is a problem long after I’m dead and gone, any pen repair person can re-sac the pen. The section is sealed with shellac, so it’s easily reversed. One question: why does it have to be a metallic tube? surely any material that can be airtight should do? If I used acrylic, the pen would be ridiculously thick. That makes sense. Time for Scotty to travel back in time and release the secret of transparent aluminium to you, methinks. I’m sorry if this is a dumb question, but can the nib and feed be removed or is it fixed like the section? The nib will unscrew from the section, just like all other Edison Pens, so nib exchanging will be easy. I will do a video blog in the near future explaining this. Hi Paul! Thanks for the kind words! Although I’m flattered, I wouldn’t anticipate a snorkel-type filler with this pen. The engineering for this pen as is has been going on since early October. Adding a snorkel to this might take me a couple of years, if I honestly wanted to take that on, I’m sure! Hello I’m a twenty year old college freshman living in Palm Bay Florida, and I just wanted to add my voice to the pen loving choir by sharing with you something I just found about pneumatic fillers. Did you know that Frederick William Bender patented AND produced the first pneumatic fill fountain pen about fifteen years before Chilton? I sure didn’t… till I got curious. I guess curiosity is a good thing sometimes. Here’s the link: http://vintagepensblog.blogspot.com/2014/08/bender-pneumatic-filler.html. I knew of Crocker, but not Bender! Thanks for sharing! Awesome revival! Couple questions: Would you be able to install a silicone sac instead of a latex one? Also, could it be requested for the section not to be sealed to the body in anticipation of future sac replacements down the road? I’m fantasizing about getting one with the clear mint swirls, and imagine a transparent silicone sac would allow one to peek at the ink levels when moving the brass bar out of the way. Hi Janda. Thanks for the kind words! Really latex is best. I tried silicone sacs, but the ones that I used were not gas impermeable, making them worthless. PCV sacs are an option on most pens, but not this design. The PCV sac is much more “sticky” than latex. So the pneumatic mechanism grabs the PVC sac rather then allowing it to penetrate during filling. I can’t use those either. Also, don’t forget that even if I made a pneumatic in a translucent material, remember that the brass mechanism will cover the sac. So you wouldn’t be able to tell ink levels, regardless. And yes, if you want your section to not be sealed, we can do this, but I would want to discuss a few items to be sure that you understand how to properly maintain the pen with the unsealed section. Thanks! Yes no problem with either flex nib on a pneumatic filler. The Binder Flex nib will be between $550-615 depending upon tip size. 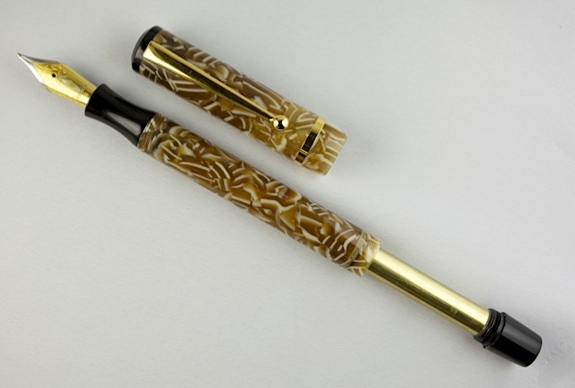 The Edison stock flex nib will be $475. Thanks!